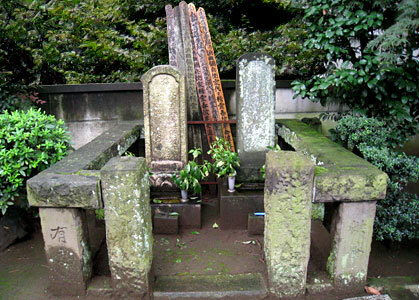 Left side is the grave stone of the founder Hamada-ya Yahei, while the right stone belongs to his son or grandson who died in 1755. As I started to live in Hamadayama, I want to explain about this small but cheerful town. Hamadayama is located in the west to Tokyo and a quiet residential area. 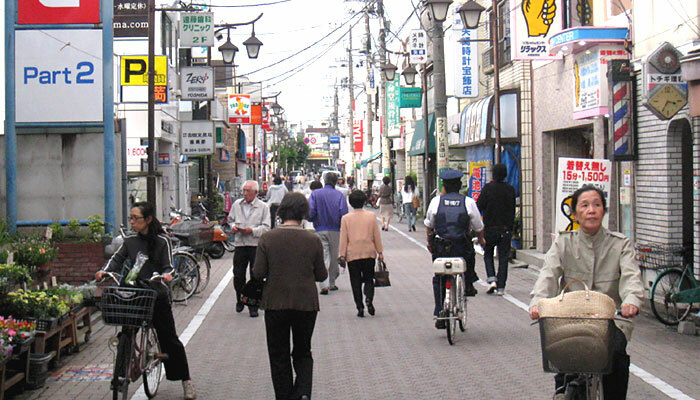 The western areas of Tokyo are later developed than its traditional central or eastern areas. During the Edo Period the present residential areas of West Tokyo were either woods with various kinds of trees or farmlands to supply the capital with fresh vegetables and they were called as a whole Musashino Plain. Hamadayama was a part of Shimo-Takaido, a small post-station village of the Koshu Highway, and was nothing but agricultural land with a few farmers' hatches. The only special characteristic of the area was that it was owned by a rich merchant resident in Shinjuku. Hamada-ya Yahei, the founder of Hamada family, moved in the late 17th century from Hamada commune of Ise Province, a part of present Tsu City, the capital of Mie Prefecture, to Shinjuku and started his rice wholesale shop using the name of his hometown. Hamda family built its graves in their estate in Shimo-Takaido and whenever they visited the graves for seasonal Buddhist services, the family members rode on gorgeous couches and generously presented small coins and sweets to the village children. Visits of the Hamada family were thus big events for the local people and the forests of Hamada family became known to everybody as "Hamadayama" ("Hamada Hill"). The festivities ceased to exist at the end of the 19th century, when Hamada family lost their fortunes through speculation in the rice market. However, "Hamadayama" was adopted by the Government as a place name and when Inokashira railway line was constructed in 1933, Hamadayama became a station name. In fact, Hamada forest was located rather remote from Hamadayama station - about 15 minutes' walk - and now the regional post office and Kabashima Hospital exist on the ground of the original place of Hamadayama. Two grave stones of the Hamada family members, the founder of Hamada-ya and probably his son or grandson, were moved from the original place to the ground of Rishoji Temple, in the north to the Nishi-eifuku station in May, 1945. There are some relatively new "sotoba" ("wooden stupa") behind the gravestones. This could mean that the family still exists and takes care of these old graves. 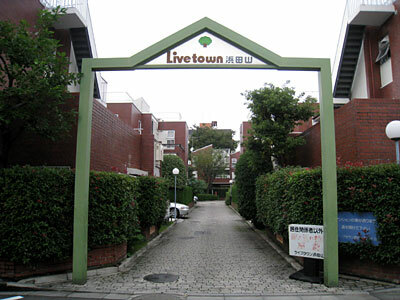 The main entrance of Livetown Hamadayama, which was built in 1997 (left). 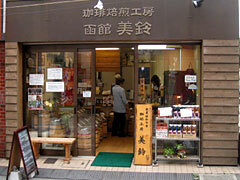 I like especially this coffee-bean shop Misuzu (right). At Misuzu you can choose and blend from about forty different kinds of coffee beans and after some 150 seconds you can smell the enchanting aroma of the freshly roasted beans. 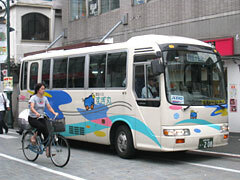 This small bus "Sugi-maru" is operated by Suginami-ward. Sugi-maru connects three places within the ward - Asagaya - Hamadayama - Shimo-takaido and makes up for the north-south transport of the area. The fee is mere 100 yen (95 cents). 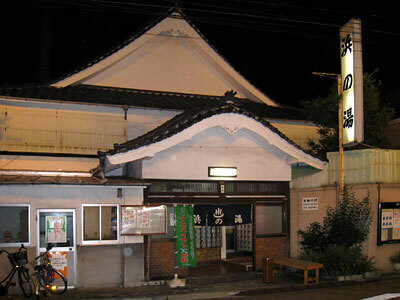 My favorite public bath "Hama-no-yu" is very much loyal to the tradition. Though Inokashira Line started its operation already in 1933, Hamadayama kept its provincial nature until around 1980. The epoch-making event in the development of Hamadayama was the opening of "Livetown Hamadayama" in 1977. It is a building complex of 86 apartment houses and a few dozens of shops and one of the earliest examples of space development in Japan. The size of individual apartment houses is not big. However, the planning concept has not lost its actuality. Hamadayama is a comfortable place. There is a mixture of modernity and tradition. There are big and modern buildings as well as small and individualistic houses. The shopping streets are not huge, however, you can find numerous interesting restaurants and shops. I am personally happy to have found good shops and eateries, which sell for example coffee beans, tofu, "tonkatsu" (port cotlett), "ramen" (noodle soup), soba and Japanese sweets. I am happy to mention that there is even a public bath - "sentoh" - with authentic design and facilities. Though I have my own bath at home, I visit Hama-no-yu when I would like to relax myself in a spacious bath with extremely hot water!